Coffees, hot chocolate, teas, pastries, cakes, sandwiches, salads, hot food freshly prepared in our kitchen (all to eat in or take away). If you are hosting a party this season or an office meeting, we do offer platters of cured meats, cheeses and sandwiches. 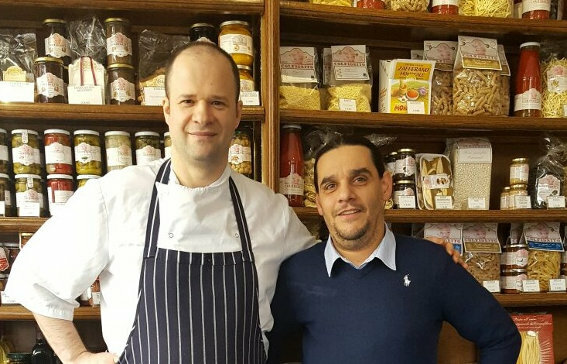 Freshly cut cheeses, charcuterie, fresh handmade pasta prepared in our kitchen, dried pasta, sauces, pastes, preserved products, oils, vinegars, biscuits, chocolates, soft drinks, wines and spirits. Wide selection of hampers and gift baskets or customisable hampers which allow you to hand-pick favourites + shipping available. We import all our products directly from small farms throughout Italy; they are not industrial products - you won`t find them in supermarkets. In fact, all of our producers are family run businesses and are well known for their excellence and quality produce. If you are not sure what to cook for dinner, come and pop in and you will definitely not leave empty-handed. *The last orders are taken by this time, but you are welcome to stay longer and enjoy our food or drink. Since 2006 we have successfully fed the people working and living nearby, as well as those just passing through. I, Melo, had always nurtured a dream of having my own restaurant and as we approached a decade of successfully feeding the locals, we had decided to refurbish the premises to make room for a 23 seat restaurant. The work was completed in August 2014 and the new space was named `Locanda del Melo`. Our menu has traditional favourites cooked according to traditional recipes, with seasonal ingredients and changes frequently. Follow us on facebook or twitter for latest menu and news.